Lectures are held at Avenue House, 17 East End Road, Finchley N3 3QE, starting at 8pm, with tea/coffee and biscuits afterwards. Non-members are welcome (£1.00). Buses 82, 125, 143, 326 and 460 pass nearby. Finchley Central Station (Northern line) is a short walk away. Sunday 15th September to Thursday 19 September Buxton Trip. See February newsletter for details, or contact Jim & Jo Nelhams (020 8449 7076). Tuesday 8th October, 8pm Brunel’s Tunnel under the Thames. The first tunnel under a river anywhere in the world, built by Sir Marc Brunel and his son Isambard Kingdom Brunel (then only 19 years old). A lecture by Robert Hulse, Director of the Brunel Museum. Tuesday 12th November, 8pm The Lions on Kunulua: excavations of the Early Bronze and Iron Age periods at Tell Tayinat, Hatay, Turkey. Lecture by Dr Fiona Haughey. Sunday 1st December, 12 noon – 4.30 pm (approx.) HADAS Christmas Party at Avenue House. Buffet lunch. Price £25 to include one drink. Cash bar. Booking details coming soon. The 52nd Annual General Meeting was held on Tuesday 11th June at 8pm in Avenue House. The meeting was attended by 34 members with apologies from a further 10. The Chairman, Don Cooper, introduced Harvey Sheldon, who had completed his second 5- year term as President. He was re-elected unanimously to serve a further 5 years. He graciously accepted and proceeded to chair the meeting. The officers of the Committee were re-elected unopposed. Two members of the Committee, Andrew Coulson and Mary Rawitzer, have not offered themselves for re-election and the Chairman thanked both of them in their absence for their long-standing service to the Committee. The remaining 6 members were re-elected. Two members, Roger Chapman and Simon Williams, offered themselves to serve on the Committee and were duly co-opted. The Committee consists of Chairman Don Cooper, Vice Chairman Peter Pickering, Hon. Treasurer Jim Nelhams, Hon. Secretary Jo Nelhams, Hon. Membership Secretary Stephen Brunning; and Vicki Baldwin, Bill Bass, Roger Chapman, Eric Morgan, Andrew Selkirk, Tim Wilkins, Sue Willetts, Simon Williams. A discussion took place concerning the position of Church Farmhouse, which has remained in the possession of Barnet Council since its closure. Middlesex University has been granted a 4-year lease but the conditions are still in discussion. English Heritage have not so far included it on the Buildings at Risk register. There followed presentations of some of the Society’s activities during the year. HADAS have been approached by a number of schools in recent years and have worked with UCL. Don Cooper gave a summary of the 2012 dig at Hendon School and an account of the Thames Foreshore walk led by Dr Fiona Haughey, which was a follow-up to her lecture in May. Bill Bass gave a presentation on the dig which took place at Martin Primary School and also a dig in the grounds of Church Farmhouse, but no sign of the Saxon ditch was found. The evening concluded with Vicki Baldwin giving a picture whistle-stop tour of the long weekend in Ironbridge. Following Fiona Haughey’s excellent lecture to HADAS in May (see Peter Pickering’s report) on the Thames at Bankside, she offered to lead a walk along the foreshore on Saturday 1st June 2013. About eighteen members of HADAS and the HADAS finds course turned up on a lovely sunny afternoon. is important that the foreshore is combed on a regular basis to try and ensure that we extract as much as we can from the artefacts revealed. Thank you Fiona for a lovely afternoon. I’m sure we all enjoyed it. I know I did. · Maritime Archaeology covers all of the above, and includes trade and industry (including coal), the people involved, and more. Underwater archaeology started with diving bells which required connection to the surface by a tube. In 1782, the Royal George capsized in Portsmouth Harbour, and first attempts at salvage in 1786 using a diving bell succeeded in raising some of the cannon. In the 1830s, using air-pumped diving suits, further salvage attempts were made. The invention of SCUBA (Self-Contained Underwater Breathing Apparatus) by Emile Gagnan and Jacques-Yves Cousteau had made everything easier. The first striking success using SCUBA was the salvage by George Bass of a Bronze-Age vessel near Cape Gelidonya in Turkey. This included recording the vessel in position. Techniques resemble land-based work, including the use of planning frames and measurements to create a three-dimensional image. Sand was removed using vacuums. Dramatically improved facilities such as sonar and computer imaging techniques have enabled the comparison of wrecks to the original ships’ plans. The study of submerged landscapes has shed light on interglacial development and historic global warming. An example is Doggerland in the North Sea, where commercial survey data has been used to map the seabed, though the area has not yet been fully surveyed. Another example is Tybrind Vig, a Mesolithic settlement in Denmark 250m from the coast and 2-3m under the water. Many artefacts have been found, including log boats and the oldest textiles yet found in Europe. In 1999, a Mesolithic site was found near Bouldnor, close to Yarmouth on the Isle of Wight. Finds on the Thames foreshore have been dated back to 4500 BC. Some current projects include the recovery of the Holland 5 submarine, which sank under tow in 1912, and was rediscovered in 2000; a number of abandoned hulks in the Severn Estuary; and an underwater discovery trail for divers at Norman’s Bay in Sussex. Other projects exist across the globe. Underwater sites are difficult to protect and treasure-hunters are a problem, though more in the USA than Britain. Recovering wrecks to land is very expensive and requires extensive conservation work. So wrecks in place need regular recording as the sand moves. War graves have little protection outside territorial waters, and many wrecks are in international waters. The Council for Nautical Archaeology was created in 1964. In 1972, this became the Nautical Archaeological Trust, a registered charity, which was reconstituted as the Nautical Archaeology Society in 1986. The Society (www.nauticalarchaeologysociety.org) has a strong training syllabus, now adopted by many other countries, and strives to develop awareness of the subject. This sometimes brings conflict with environmentalists. At Elliott’s request, his fee was sent as a donation to NAS. During our Ironbridge trip last year, we were privileged to be shown the conservation centre at the RAF Museum at Cosford, and were told about the wreck of a Dornier 17 bomber in the North Sea. Our guide had been involved in the raising of the Mary Rose, and he told us of plans to raise the Dornier. Recent news on the television has shown the successful lifting of the aircraft, which has gone to Cosford for attention before display at Hendon. Following our visit, HADAS sent a donation to the Dornier fund. ● £6 for members under 18, or between 18 and 25 and a student in full-time education. If you have any queries, please do not hesitate to contact me by email (preferred), or telephone. Thank you. Martin School is a primary school located in Plane Tree Walk near East Finchley. 2013 is their centenary, and with support from the Heritage Lottery Fund’s All Our Stories programme they are exploring the history of the school and its place in the local community. The project will include oral history interviews, archive research, community events and an “archaeological dig”. To this end Roger Chapman, a Martin School governor and local archaeology enthusiast, got in touch with HADAS and the UCL during 2012 with a view to us conducting such a dig. On Saturday 1st December 2012, HADAS conducted an informal resistivity survey in the school playing field. This showed a series of regular lines running from SW-NE which looked suspiciously like a field-drain pattern, together with other indications on the resistivity, Victorian finds, and “lumps & bumps” in the field. It was felt that a test-pit excavation and further survey was a viable proposition. An archaeological programme of events was drawn up to coincide with the school’s History Week, 22-27 April 2013. 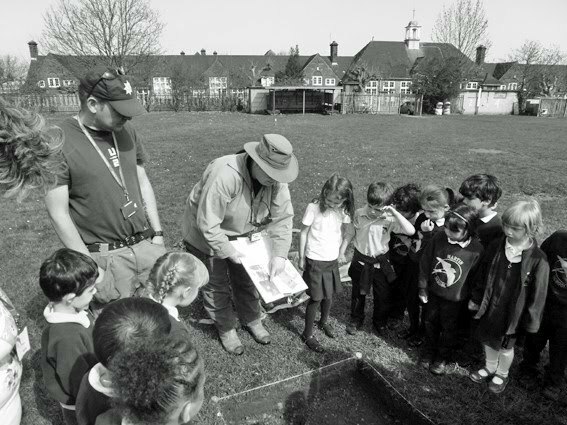 The aim would be to show Year 3 pupils (and any other interested children/adults) what is involved in an archaeological project – looking at maps, local find spots of archaeology, laying out a formal baseline/grid for surveying purposes, checking OD heights from a bench-mark, digging in a test-pit and washing/interpreting their finds. The school lies on the east side of High Road (Great North Road), East Finchley, grid reference TQ 27002/89970. Its playing field, adjacent to the south of the school, has fine views overlooking allotments and the ancient woodlands of Coldfall Wood. The land falls away to the north and to the east, and a bench-mark on the wall in front of the school indicates an OD height of 288.40 feet (87.90m). The archaeological site code is MPS 13. Earlier maps of the area (kindly supplied by Roger), such as John Rocque 1754, tithe maps 1814, and various OS maps including 1896 and 1950s and others, show that the playing field and what was there before it appears to have always been open ground or fields and has never been disturbed by substantial development. The medieval Great North Road later became the major coaching route through north London. Around 1660 a pig/hog market was developed around Market Place (west of the Great North Road), and pigs were brought in from far and wide to be fattened for the London markets. This is covered by an Area of Special Archaeological Significance. A massive parcel of land just to the north of the school was developed into what is now St Pancras and Islington Cemetery in 1854. In 1913 the school was laid out along with the adjacent playing field. 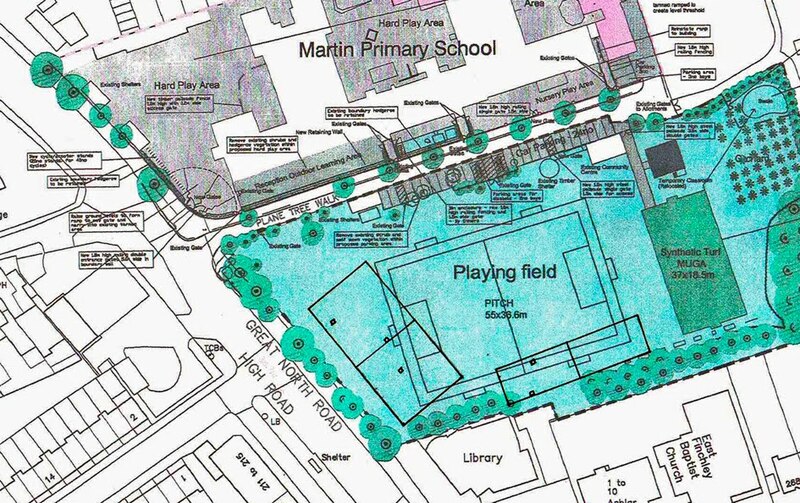 The architectural plans show a section of land at the west of the playing field (along the Great North Road) being laid out as some form of formal garden with a central fountain, shelters, benches, trees and walkways. However, it is not clear if this was ever built (there are indications of a shortage of funds towards the end of the school construction). At the start of the History Week HADAS/UCL plotted out a baseline based on a line projected from the front of the East Finchley Library building immediately south of the site, and into the playing field, giving a straight edge which we can plot on a scale map. Two grids (1 & 2) were laid out (20 x 40m in area) N-S along the baseline (figure 2). Two further grids (3 & 4) of similar dimensions were plotted E-W along the southern edge of the playing field. Dug in an area between two of the field-drain lines and shown as an anomaly on the resistivity survey, the trench featured a layer of gravel and larger stones beneath the topsoil, with a clayey soil over the natural clay (reach at 88.03m OD). Finds included corroded iron nails, scatters of glass, and white refined and stoneware pottery, mostly 19th to 20th century. This trench was placed over one of the straight lines seen running SW-NE on the resistivity survey, and was thought to be a field drain. Below the topsoil, which contained a fair amount of ashy type clinker, a “drain” feature did indeed appear. It consisted of a light/friable porous “concrete” type material, and each section was octagonal in shape, approx. 0.14cm in diameter and 0.30cm long. It was laid in a cut and surrounded with clinker and slag. The drain was dug into a gravel layer and then a silty clay layer  of possible Victorian/early 20thC date. It sat on a fine clay bed above the natural clay at approx 88.27m OD. The current theory is that it relates to the laying-out of the school and playing field in 1913. But further research is needed as it is of a type we haven’t seen before. Placed over an area of “high” resistivity, the topsoil was immediately busy with many (modern) finds - pot, building material, glass, etc. (including a 1974 penny). Below this was a gravel/rubble deposit, which then turned into a brick/rubble demolition “fill” which had finds of pot, glass, nail and some electrical fittings throughout. Eventually a reinforced “shuttered” concrete wall began to appear, running E-W across the northern area of the trench. The wall was approx. 0.12cm thick, the top splayed out to approx. 0.16cm, but the roof of the feature had been smashed and torched off at some point. This concrete wall appears to have been dug into the natural clay at the northern edge, around 0.48cm below the turf layer at 88.39m OD at the trench NW corner. No other walls were seen in the trench. The rubble appeared to be thinning out at 0.80cm below the turf layer, no floor was seen, and excavation had to stop due to time and safety reasons. The brick rubble consisted of various types and colours of brick, ranging from “modern” clean red and yellow frogged types to worn, broken and friable red and yellow frogged bricks. Some bricks were not frogged and may be earlier types. The wide variety of bricks seems perhaps to make them unrelated to the concrete wall and therefore possibly backfilling from nearby building demolition or a wartime bomb site. The Finchley Bomb map shows a bomb landing in nearby Creighton Avenue, and some further afield. No structures or buildings are seen on any maps in this area and so the nature of it is unclear. Theories include an underground air-raid shelter, and a ring of above-ground shelters can be seen surrounding the school, some on the northern edge of the playing field. At a recent open day, none of the former pupils from that era could recall an underground air-raid shelter in this area. Other thoughts include an underground culvert of some kind. A similar survey covered grids 3 & 4. These were laid out over an area which would have been the apron of a sports pavilion on the southern edge of the playing field. Two 1.00m test- pit squares were positioned here for excavation. material. No features were noted, with natural clay encountered at 88.21m OD. Test-pit 5, a high-resistance spot, also revealed a similar mix of finds, although this trench was deturfed and the topsoil used for the pupils to practise excavating and sieving only. The soil matrix of test-pits 4 & 5 had a dark black burnt feel to it, with copious amounts of clinker and slag, with some concreted to the pottery and other artefacts. Some bonfires have been reported in this area, but perhaps a higher temperature was involved with the demolition and burning of the nearby pavilion and associated debris? The natural subsoil is reported as Glacial Till, which consists of brown mottled grey, slightly sandy/silty/gravelly clay (Martin School Planning Statement, Mouchel 2013). The History Week appeared to be a success, with the pupils learning about their school’s beginnings and the wartime years. One of the air-raid shelters was used to evoke the atmosphere – tapes of droning wartime bombers and the “all-clear” siren could be heard from the dig. We used the same shelter as our tool store. Over several days young students came out to practise the various methods used in archaeology (figure 3). They seemed to enjoy themselves, although the worms sometimes attracted more attention than the finds! Of the archaeology, the use of small test-pits usually throws up more questions than answers. 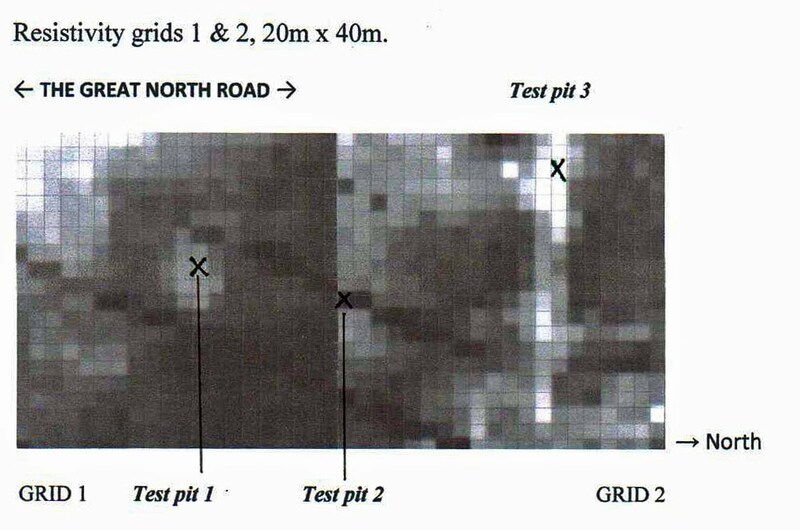 It was pleasing to see that the test-pits more or less corresponded with the resistivity results – the prediction of the field drain and finding the high resistivity of the buried wall and rubble in test-pit 3. This deep-buried wall feature was a bit of a surprise and difficult to interpret, so more excavation is planned for this area, possibly using a machine – watch this space. HADAS: Don Cooper, Tim Curtis, Jim Nelhams, Vicki Baldwin, Angie Holmes and Andy Simpson. Clair Umbo. UCL: Elena Alexi, Hannah Page, Agathe Dupyron, Sarah Dhanjal and Gabe Moshenska. Martin School: Roger Chapman, Tristan Green, Helen Morrison. This new summer archaeology course at the City Lit explores some of the major disasters that have beset the city, and its responses to such traumas as Londinium’s collapse, Saxon Lundenwic’s abandonment, the dissolution of the monasteries, and the Great Fire of 1666. ● For further information visit the City Lit website or contact Humanities on 020 7492 2652. Shakespeare’s Globe Theatre is staging three plays on the same day at four historic battle sites of the Wars of the Roses: Towton, Tewkesbury, St.Albans and Barnet. The Barnet performances will be held on Monken Hadley Common on Saturday 24th August, beginning at 12.30pm. The plays are Harry the Sixth, The Houses of York & Lancaster and The True Tragedy of the Duke of York. There will be breaks between the three shows and so you can bring a picnic, peruse the food stalls and enjoy the local pubs and walks. A day ticket costs £45. Book online at www.monkenhadleycommon.net or telephone the box office on 020 7401 9919. … but where did the Battle of Barnet really take place? The Battle of Barnet on 14 April 1471 was one of the most important and eventful battles of the Wars of the Roses. It was the defining moment of a power struggle between the two men who had dominated England since 1461: King Edward IV and his cousin, Richard Neville, Earl of Warwick. The battle itself is perhaps best known for the fact that it was fought in fog, which made it an unusually confusing and terrifying affair. Three weeks before the battle, Edward IV, the Yorkist King of England, landed on Spurn Head with a tiny force of perhaps two thousand men. He faced an almost impossible task against the combined forces of his uncle, the Earl of Warwick, and the Lancastrian faction. In an audacious campaign Edward had evaded pursuing armies, recruited a sizeable force and raced south followed by the army of the Earl of Warwick. On 11 April the citizens of London opened the city gates to Edward, who captured Henry VI and rescued his wife Elizabeth and their son from their sanctuary in Westminster Abbey. On 13 April Edward and his army of around 9,000 marched out to confront Warwick: .....he roode to Barnete, x myles owte of London, where his aforne-riders had founden the afore-riders of th'Erles of Warwikes hooste, and bet them, and chaced them out of the towne, more some what than an halfe myle; when, undre an hedge-syde, were redy assembled a great people, in array, of th'Erls of Warwike. Barnet also has something to tell us about the development of the use of gunpowder weapons. Warwick had access to the Tower Arsenal and could have had up to 100 field pieces: ....on the nyght, weninge gretly to have anoyed the Kynge, his hooste, with shotte of gonnes, th'Erls fielde shotte gunes almost all the nyght. But, thanked be God! it so fortuned that they alway ovarshote the Kyngs hoste, and hurtyd them nothinge, and the cawse was the Kyngs hoste lay muche nerrar them than they demyd. »» The precise battle site cannot be stated with certainty. The main contemporary source places it up to a mile north of Barnet and one account mentions a hedge, thought to be on Old Ford Manor Golf Course. The English Heritage Battlefields panel placed the most likely site of the Battle of Barnet as being: "Hadley Green, due to it being a plateau and the highest local ground on the Great North Road. The most obvious site for the Lancastrian deployment is the ridge leading west of Hadley common, with the left east of the junction between Hadley Highstone and Dury Road and the right stretching across the golf course. The Yorkists probably deployed across the road at the northern edge of modern High Barnet." The interpretation of the battlefield of Barnet has changed over the last two hundred years. The first interpretation was by Alfred J Kempe, a contributor to the Gentleman's Magazine in 1844, who positioned the overlap of the Yorkists over the Lancastrians on the western side. In January 1882, Frederick Charles Cass, the rector of Monken Hadley, published an account in the Transactions of the London and Middlesex Archaeological Society which positioned the battlefield in the area accepted by English Heritage. The vicar was the first to identify the site as Monken Hadley and the orientation as north-south. In 1892 James Ramsay published Lancaster and York. He interpreted the battle with Warwick's line extending not from east to west, but from north to south along the line of the old St. Albans road either side of Hadley High Stone, in order to take the King's troops in detail as they came out of the narrow streets of Barnet. This interpretation was echoed in C.R. B. Barrett's Battles and Battlefields in England (London 1896). It remained unchallenged until Alfred Burne, an experienced soldier of the Great War and local resident, put forward an interpretation that returned to that of Charles Cass. He linked the comments about Warwick's deployment close to a hedge to the ancient hedge on Old Ford Manor Golf Course. The Battle of Barnet is depicted in many books about military history. However, in most cases the interpretation rests on the above interpretations. In many cases the interpretations include fanciful detail such as the location of the archers, cavalry and cannon for which there is no documentary evidence. These may have been present, but we have no evidence to suggest how they were employed. The creation of the battlefields register by English Heritage was a landmark for battlefield preservation in England and indeed the UK. For the first time battlefields would receive some form of statutory protection. The battles had to meet the criteria that they were significant, the location was known and the battlefield itself had not been built over. Barnet was included with the initial assessment and the Burne interpretation was broadly followed by English Heritage in 1995. Yet inconsistencies in the English Heritage interpretation have become more glaring. The Hadley Green position appeared to be simply too small to accommodate the forces. Did the Earl of Warwick really deploy 15,000 men on a frontage of less than a kilometre? This would be 15 deep, approximating to the depth of the phalanxes of Macedonia and the Swiss pikemen. Fitting these men into the Hadley Green position demands that a substantial part of Warwick's army fights with the slope to Dead Man's Bottom at its rear. The battlefield is far from a level plain. The Lancastrian line appears to pass through Old Ford Manor and Monken Hadley Church, neither of which is mentioned in the accounts. No archaeological evidence of the battle has turned up. Surely, if an army fires up to one hundred guns all night, the cannon balls must have gone somewhere? Something should have been dropped or lost. The TV series Two Men in a Trench excavated around the ancient hedge on Old Ford Golf Course, but found nothing conclusive. No-one expected to find much from a battle that occurred 500 years ago. In around 2005 the Battlefields Trust worked with a group from HADAS to try to find more about the battlefield. HADAS member Andrew Coulson collected information about reported finds of shot, and local stories about battlefield finds, graves and battle accounts. A local historian, Brian Warren, carried out a remarkable piece of work, interpreting the landscapes of the 16th century from old Land Registry entries as well as identifying the chantry for the dead at Kitts End. This was sufficient for the Battlefield Trust's project officer Dr Glenn Foard to propose an alternative location further north, at Kitts End. The success of Glenn Foard and his team in rediscovering Bosworth opens up another possibility. As with Barnet, no-one had found evidence for the battle. But it was not because the material had decayed or been salvaged. It was because archaeologists had been looking in the wrong place. Perhaps the reason no-one has found anything at Barnet is because we have been looking in the wrong place? Bosworth shows that with modern tools and techniques, patience and some good fortune, it is possible to find the relics of battles of this era. Monday 5th - Friday 9th August & Monday 12th – Friday 16th August. WEAG and Copped Hall Trust Archaeological Project: Field Schools 2013. Continuing excavations of the Tudor Grand House near Epping. Full details in June Newsletter. To book, contact Andrew Madeley, 27 Hillcrest Road, South Woodford, London E18 2JL. Phone: 020 8491 6514. Email: coppedhalldigs@weag.org.uk. From 10am London Canal Museum, 12-13 New Wharf Road, Kings Cross N1 9RT. Celebrate Ice. Descend the ice wells, see new exhibits and new exhibition on the ice trade. Open day marking culmination of the Ice Project. 2-3pm. Forty Hall, Forty Hill Enfield EN2 9HA. Rainton Tour offers a look at the private and professional life of Sir Nicholas Rainton in his home. £8 (£5 concessions). Monday 12th August, 1.30-4.30pm London Canal Museum (as above). Digging Deeper Study Day: Gatti’s Empire. LCM research team: London at Work and Leisure in the 19th century and Gatti’s influential role. Talks on the ice trade to music halls, and past city life. £10 including refreshments. To book online visit www.canalmuseum.org.uk/book, or phone 020 7713 0836 (£1 booking fee). »» Thursday 15th August, before 8.30pm Highgate Cemetery, Swain’s Lane N6 6PJ. East Cemetery late opening. Entrance £4. Also evening tours at 7.30pm, tickets £8. Book on www.highgatecemetery.org/events. Friday 16th August, 7pm CoLas, St Olave’s Parish Hall, Mark Lane EC3. Members’ evening. Talks by members. Visitors £2. Refreshments. Saturday 17th August, 2-3pm Forty Hall (as above). Architectural tour offers an in-depth look at the interior and exterior architecture, including the cellars. £8 (£5 concessions). Tuesday 27th August, 2-3pm Harrow Museum, Headstone Manor, Pinner View, North. Harrow HA2 6PX. History of Hatch End. Talk by Pat Clarke. £3.